Facebook has revealed that it’s first custom-built data center in Asia will be located in Singapore. The 170,000 square meter data center represents an investment of more than S$1.4 billion ($1.01 billion), and forms part of the company’s growing presence in Singapore and across Asia. “We selected Singapore for a number of reasons, including robust infrastructure and access to fiber, a talented local workforce, and a great set of community partners, including the Economic Development Board Singapore and JTC who have helped us move this project forward,” said a statement released to the press. The statement further said that Singapore has also established policies that foster a business-friendly environment, including measures that support the enforcement of contracts and increase the ease of construction permitting. The World Bank recently named Singapore as the number one country in Asia to do business. 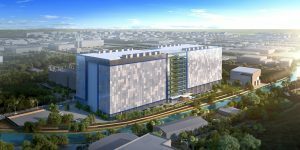 The Singapore Data Center will join Facebook’s portfolio of facilities designed from the ground up with new features to minimize the use of water, energy, and land, according to the company. Citing an example, the company said the data center will be the first to incorporate the new StatePoint Liquid Cooling system. This technology minimizes water and power consumption and, according to the company’s testing, can reduce the amount of peak water used by 20% in climates like Singapore’s. “We expect this facility, like all of our data centers, to be powered by 100% renewable energy and we are currently working to increase the development of new solar resources in Singapore,” said Facebook in the statement. “When compared to other facilities in the region, it will be a leader in energy efficiency with annual Power Usage Effectiveness of 1.19. This means that almost every watt going into our data center will be used to run the computing equipment.” Finally, to conserve space, Facebook has developed a new 11-story building design specifically tailored to Singapore. The building façade is made out of a perforated lightweight material which allows air flow and provides glimpses of the state-of-the-art mechanical equipment inside. In order to complete this project, Facebook has selected Fortis Construction to act as general contractor because of our joint experience building efficient data centers. “This data center, and the hardware inside, will help people stay connected with friends and family, discover what is happening in the world, and share and express what matters to them. And we are thrilled to be building it here in Singapore,” said Facebook in the statement.